On this exclusive tour we introduce you to the jewels of Jordan’s cultural and historical heritage. In 7 days, you will discover the old city of Amman, Jerash, “the Pompei of the East”, Mount Nebo to view the Holy Land and the stunning crusader castle of Kerak. Following the spectacular Kings Highway you arrive at the new seventh wonder of the world, Petra, for a full day in the ancient Nabataean city. Later the breathtaking desert of Wadi Rum invites you to travel in the landscape of the Bedouin, before finally moving eastwards to explore historic desert castles. Arrival at the airport, where your guide and your driver will meet you to transfer you to Amman/Madaba, around 20 minutes drive for overnight. This morning we take the city tour of Amman with visits to the Roman amphitheatre, the historic Citadel and the fascinating folklore museum. After lunch we drive to Jerash, the world’s best-preserved Roman provincial city, built over 2,000 years ago and known as the ‘Pompeii of the East’. We explore the antique city, with its colonnaded street, forum and temple, including a 1 hour guided tour with an English speaking guide. Later we move on to the Dead Sea where you can enjoy the amazing floating experience in the salty waters of the lowest point on earth. Overnight at one of the select resorts on the Dead Sea (5* hotels only available). Today spend a full day visiting the red rose city of Petra, the biggest attraction of Jordan. You will have a 3 hours guided visit with an official cultural guide, and you will have additional free time to explore areas of the site on your own. Petra was founded around the 6th century B.C. by the Nabataean Arabs, a nomadic tribe who settled in the area and began a commercial empire. Starting your tour walking through the Siq, the first monument you see is the breathtaking Treasury. Walk from here to the Street of Facades, the Royal Tombs and Pharaoh’s Castle, and if you wish, explore further amazing structures including the Monastery and the High Place of Sacrifice. Take lunch in one of the restaurants located within the site itself, and spend a second night in your 3* hotel in Petra. Overnight in your Petra hotel. After breakfast we leave Madaba and travel by the King’s highway to the stunning crusader castle of Kerak. Next we move on to visit Jordan’s largest nature reserve at Dana, the most diverse area of plant life in the country and home to endangered species including Nubian Ibex and Caracal. Finally we arrive at Petra, the jewel of Jordan’s archeological past, where you will take dinner and stay overnight in a comfortable hotel close to the entrance to the ancient site, ready to discover its highlights on day 5. Travel one and a half hours from Petra to Jordan’s most recent UNESCO world heritage site, the spectacular desert of mountains, Wadi Rum. After a first tea with your local Bedouin guide, you will ride friendly camels through wide, golden valleys, take a jeep tour through the desert to see amazing natural rock bridges (you can even climb one!) and walk through one of the beautiful hidden canyons of the desert. After watching a beautiful desert sunset you will spend a night under 1,000 stars in a private, secluded Bedouin camp dining on freshly-cooked traditional food and sleeping in comfortable goat hair tents. *An alternative tour is available: jeep and walking only. Overnight in private Bedouin camp in the Wadi Rum desert. After breakfast we leave Wadi Rum, headed for the desert castles of the East. The first castle we visit is Qasr Al Kharaneh, located 55 km away from Amman. It is probably the only castle which had a military function, as shown by its architecture. We move on to Qasr Amra, standing to the south west of Azraq, on an island in a wadi which is almost always dry. This small, well preserved castle features clean lines with rounded walls of yellow stone the same colour as the desert, a camouflage allowing it to blend into the landscape. Qasr Amra was built in the early VIII century by the caliphate Walid I who particularly enjoyed hunting, poetry, and other pleasures within its surroundings. Next we visit Qasr Al Azraq, greatly affected by an earthquake in 1927; however the castle remains a magnificent building. The inscription above the main gate allowed archaeologists to date the restoration to the XIII century, the supposed date of the mosque built in the centre of the castle courtyard. We finish our tour back in the vibrant capital of the Kingdom, Amman. Overnight in our specially chosen hotel in Amman. On your final day we transfer you to the airport at a convenient time for your check-in and homeward travels. Hotel accommodation 3-4-5* on BB basis. Transfers in private, a/c, car/ minivan with English speaking tour leader. English speaking cultural guide in Jerash (about 1 hour). English speaking cultural guide in Petra (about 3 hours). Short horseback ride in Petra (included in ticket). Jordanian visa (40 JD at Amman airport). Lunchs, dinners and drinks (outside Wadi Rum). Our camp is located deep inside the protected area of Wadi Rum. You will never be with a lot of people at the same time, as we want to offer you a desert experience with its silence and its charm. We can also offer accomodation for bigger group on request and on a private basis. 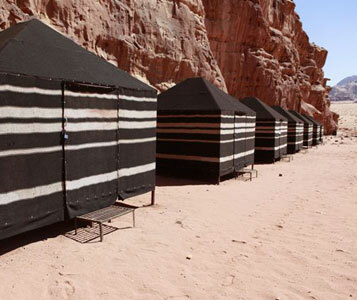 Our bedouin camp is situated 10 km away from Wadi Rum village in the valley of Abu Hassaran. We provide all the accomodations to spend an unforgettable night in the desert. You want to make a reservation or you have a question about this tour? Please contact us.